Impressive Events provides professional coordinating for weddings, parties, corporate events and more! Sometimes, you walk into an event and think, "wow," but you're not really sure why. You examine it piece by piece: terrific flowers, great color, marvelous lighting and great ambiance. And yet, there is something that pulls the whole look together, something you can't quite place...It is the details. At Impressive Events, We are extremely detail-oriented...we always pay close attention to those tiny details. Our job is to make sure that "YOUR" day goes as envisioned. Impressive Events, LLC, is located in the heart of Tallahassee, Florida. This location allows us to access most of Florida and much of Alabama and Georgia. We work with the most innovative vendors in all of these regions. Our ability to understand our clients' wants and needs, and incorporate their vision with our experience, is the perfect fusion for each of these distinct locales. Nowadays, many brides - and their mothers - are too busy with to dedicate months of time to planning a wedding. Today's bride knows that it's very important to host an exceptional day. They want a day that will be remembered as an occasion with a matchless style and an incomparable flavor. In addition, they know that it is also important that the couple be well rested on the day of their big event. For these reasons and more, it is important to seek out the outside support of a professional wedding and event planner. A good event planner always pays close attention to those little details. Sometimes, you walk into an event and think, "wow," but you're not really sure why. You examine it piece by piece: terrific flowers, great color, marvelous lighting and great ambiance. And yet, there is something that pulls the whole look together, something you can't quite place... It is the little details. For example, proper lighting is one of those "little things" that can cause an immense change in the look of a room setting. The wrong lighting, no matter how lovely it is, will stick out like a single pink tulip in a bed of yellow roses if placed in the wrong setting. At Impressive Events we always pay close attention to those little details. 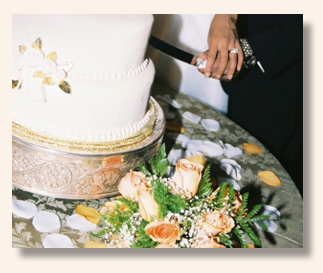 With a little help from us, you can turn any wedding or event into an elegant Memory you will cherish forever.